Peter Kudzinowski was electrocuted on this date in 1929 in New Jersey. The son of Polish immigrants to Pennsylvania’s anthracite coal mining country, Kudzinowski made his way to the Atlantic seaboard as a young man and entered the executioner’s annals by luring seven-year-old Joseph Storelli from New York’s East Village. For the promise of some candy and a movie, the boy accompanied Kudzinowski onto a train out to the New Jersey Meadowlands. Kudzinowski walked the kid into the marshes and slashed his throat. 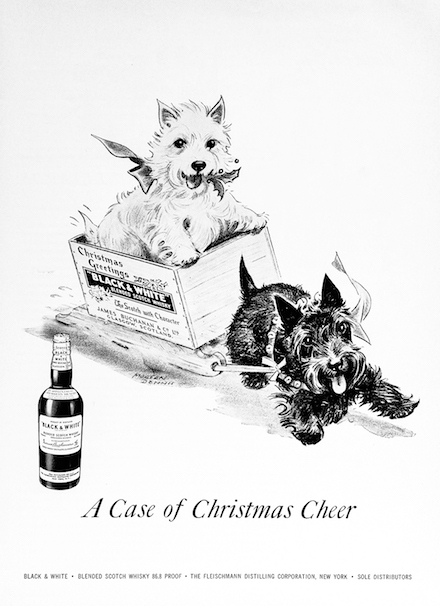 That was in November 1928. It was his third homicide but evidently the worst of the lot for the murderer. A couple of weeks later he forced a confused Detroit traffic cop to take his confession. “I’m willing to pay the penalty, and the sooner it’s over, the better,” he explained later to Detroit detectives. “I had to confess. It was troubling me.” On trial back in New Jersey, he reiterated his willingness to die and the likelihood that his body count would grow if released. Jurors understandably spurned his attorney’s desperate insanity defense. For a time he was a suspect in the cannibalistic destruction of a three-year-old Brooklyn boy named Billy Gaffney. Posterity has cleared him of that crime thanks to the later confession of a whole different caliber of mass-murderer who turned out to be operating in the same environs at the same time — Albert Fish. On this date in 1941, Brooklyn gangster Pittsburgh Phil went to the Sing Sing electric chair. Pep eschewed any single m.o., murdering with blades and bullets and garrotes and lungs full of water, and he rarely even carried a weapon lest it incriminate him on a chance arrest. Well did he know this tradecraft, for he beat no fewer than 17 prosecutions in New York. The man also took hit assignments all around the country, for other crime lords in cities whose patrolmen did not recognize him by name and reputation. And fittingly, it took another assassin to kill him. 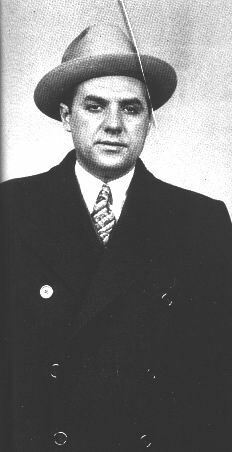 Fellow Murder, Inc. killer Abe “Kid Twist” Reles — a childhood buddy with whom he’d come up in the Prohibition crime world via Meyer Lansky‘s organization — got caught in the government’s sights and realized that his only probable purchase on life involved giving evidence against his mates. We’ve seen that his testimony did in Frank Abbandando and Harry Maione, even though Reles had “fallen out of a window” before those goons sat in the mercy seat. Reles likewise gave up Pittsburgh Phil, who in Raymond Chandler’s was “electrocuted with a sneer on his face” on this date along with his fellow Murder, Inc. plugger Buggsy Goldstein. * Why did they call him “Pittsburgh Phil”? Who knows! He is at any rate not to be confused with groundbreaking horse bettor George “Pittsburgh Phil” Smith. 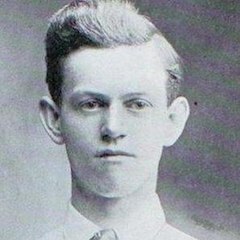 Born in England to a British mother and an American father, Ingram at age 19 had invaded the Cobb County home of J.C. and Mary Sawyer. The Sawyers complied with the armed intruder’s demands for money ($60) and the keys to their pickup truck, but Ingram still marched them to a nearby woods and executed them. J.C. Sawyer was killed; Mary Sawyer feigned death and survived to give evidence against their tormenter. I found your letter very moving and I can imagine the profound distress you must be feeling. But I have concluded, with deepest regret, that there are no proper grounds for the British Government to intervene with the State of Georgia. 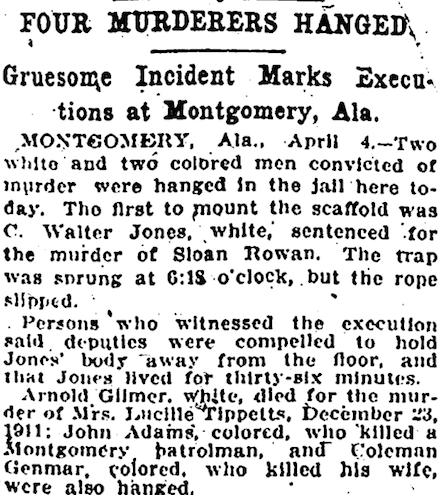 The Georgia prison commissioner who conducted this execution, Allen Ault, later turned against capital punishment. 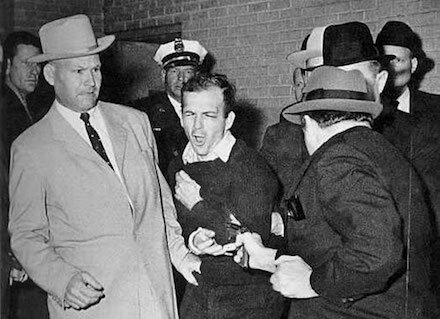 1946: Twice double executions around the U.S.
On this date in 1964, Dallas nightclub owner Jacob Rubenstein — notorious to history as Jack Ruby — was condemned to the electric chair for the dramatic live-televised murder of accused John F. Kennedy assassin Lee Harvey Oswald, captured by snapping shutters in one of the 20th century’s indelible images. Ruby would never sit on that mercy seat. For one thing, his punishment arrived as the American death penalty lulled into hibernation. 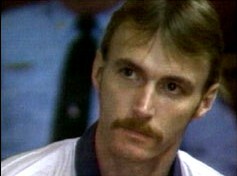 Had he lived his sentence eventually would have been vacated by the 1972 Furman v. Georgia ruling. But instead of seeing that juridical landmark, the enigmatic Ruby died in prison inside of three years, awaiting retrial after an appeal. Wallace P. Ford, Jr., a former Buffalo steelworker, was electrocuted by New York on this date in 1952. His crime, “a senseless, meaningless affair, without motive or purpose,”* in the words of his own court-appointed attorney, was the sad culmination of family woes. The man had been left by his wife, Frances, who returned to her mother’s house with the couple’s infant daughter in tow. Not long after, in June of 1951, Ford accosted Frances’s kid sister, Nancy, age 15, when the latter was picking up some groceries. Nancy told him to get lost or something — Ford would later say that it was the girl’s insisting that their family would keep his little son that made him snap — and the extranged brother-in-law bashed her with a rock. Here the horror really begins. Blood racing, Ford must have careened from panic to despair to resolution as he contemplated the crumpled but still-living girl, his already-poor judgment scrambled by stress. The assailant packed Nancy Bridges’s stunned and bloodied form into his vehicle and sped out of Buffalo looking for some way to dispose of his mistake. In that moment, for a disordered mind, that meant to finish her off. Ford said he thought about drowning the girl in Lake Erie, or pitching her off an elevated railroad. Every possible means would carry its own special horror, to be sure, but Ford settled on a truly vile expedient: he dumped her in a deserted stretch of rural Townline Road and pitilessly drove over her limp form … then popped into reverse and backed over her, too, crushing her chest and driving rib splinters into her liver and lungs. Nancy Ford’s mangled body was discovered in the adjacent woods by a teenage hunter the next afternoon. Wallace Ford must have been the first name on the lips of the family when investigators asked if they had any enemies, and he didn’t bother to evade responsibility when the police came for him. But he would have served himself better and the Fords too had he reached his epiphany of resignation a little earlier in this process. 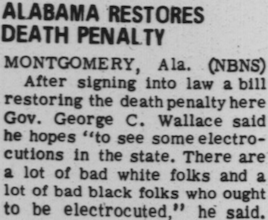 * New York Times, Aug. 26, 1952. 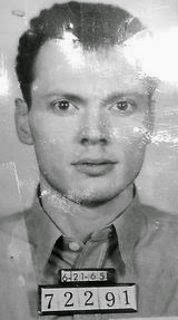 French had enjoyed five years to work out this chill fare-thee-well since the calculated murder of his cellmate in 1961, back when he, French, was already serving time for murder. It’s alleged that French committed this ruthless deed in pursuit of the mercy seat, as a form of suicide by executioner; whether this is or isn’t so he had certainly embraced the consequence by the time he presented himself to the judiciary. It’s just that his letters imploring speedy implementation of justice could not override procedural errors in his first trial (they biased the jury by presenting French in manacles) nor his second trial (bad jury instruction by the judge) until the third time charmed in 1965. The man could have lived a long life punning on his surname — perhaps he would have insisted on going by James Freedom as a post-9/11 America blundered into Iraq? — had he chosen to fight his death sentence, for even then the law’s French frying apparatus was grinding to a halt. Just two more executions — Aaron Mitchell and Luis Monge, both in 1967 — would take place in all the land before capital punishment went into a decade-long hiberation during which all previously existing death sentences were invalidated. French’s was the last death by electric chair until John Spenkelink in 1979 and the last ever electrocution in Oklahoma (which has used lethal injection in the modern, post-1972 era).